Beautiful tray, great size and quality. Looks very elegant sitting next to our soaker tub and displaying a candle, bath bombs and several vases of bath salts. 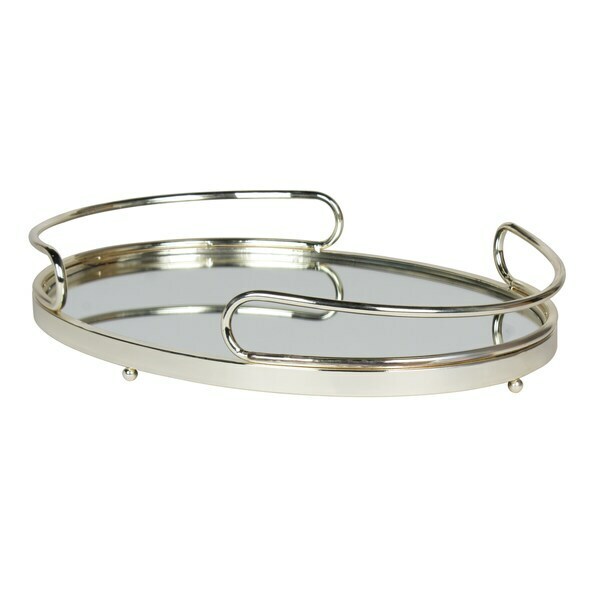 Bring modern design in your home with this striking mirrored metal accent tray. Place this charming tray on your black entrance console table as a trinket tray to hold your keys and mail as you come and go. This tray can also be used as a decorative accent on an ottoman to hold your beverages or on your vanity for make up organization. Constructed of metal and mirrored glass with a polished metallic finish, this tray is sturdy enough to serve cocktails from room to room! Its oval shape has curved metal handles and four ball feet for sturdy display. The tray measures 18 inches across by 13.5 inches deep by 3.25 inches high. Bring a chic and glamorous decorative accent into your home with this dazzling tray. This is a beautiful decorative tray - I purchased this for my own home we use it to display my husband's Bourbon and his Bourbon glasses. I keep it on the top of a floating bar that I also purchased from overstock - Shipping time was excellent and packing was perfect. The uses for this tray are endless - even as a centerpiece with some candles it would be stunning. Just got this tray for my bathroom vanity and love it! Wanted to glam up my bathroom a bit and this does the trick. Very expensive looking and goes well with the rest of my décor. After reviewing this product, found it damaged and had to return it.....had some black stuff on it- not sure what this saw...and saw some scratches. This tray is exactly what I wanted...compliments the décor of my formal living room. Very elegant. I love it! This very pretty and bigger then thought it would be,. but it works well on dresser. It's beautiful! Just what we were looking for to display our new bourbon decanter and glass set.